Enabling and empowering services, for you and your family? Companionship, in your own home or local communities? Support services, to relieve the pressure on you and your family? North East Enabling Services for you! 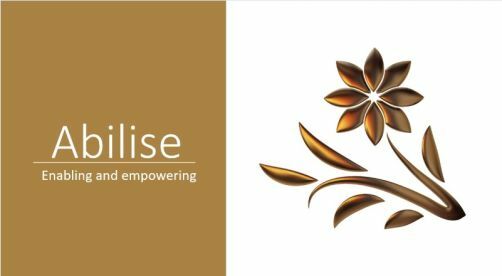 Who we are - Abilise is a fresh new business based in Northumberland, offering enabling services for those who need us most. We are a family run business, with a wealth of experience, in supporting those who need it. We have been offering our services since September 2018, and we are growing everyday. What we do - The services we offer vary greatly, depending of the needs of the service user we are working with. We offer person centred services, ensuring that the you, the service user are in control. Our experienced and friendly staff are there to deliver enablement and support services to you or your family in the comfort of your own home, or in and around the local community, What areas do we cover? - We currently cover the Northumberland area. All the way from Berwick to Cramlington, and across to Hexham and Prudhoe. We also offer our services in Newcastle, Gateshead, Durham, and North Tyneside. However, we are expending our boundaries all of the time, so if we don't cover your area, please ask! Why we do what we do - We have a family, just like you. We understand that every family model and dynamic is different. We wanted to provide a service that we so desperately needed, and was not available anywhere we looked. When can you use our service- Our service is available to all. We work closely with the local authority and take referrals from them, when they identify the need. We also work with families on a private basis. Our service is open 7 days per week. Our dedicated staff work weekends, early mornings and late nights, so you don't have to! 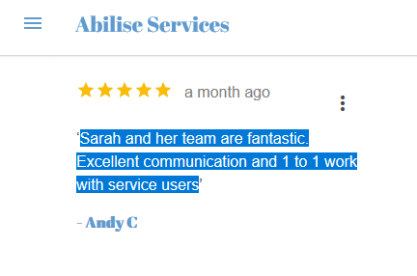 Sarah and her team are fantastic. Excellent Communication and 1 to 1 work with service users. Please note that Abilise Services may not be able to honour booking requests made.